If nothing else, Old Sock proves that Eric Clapton is comfortable being Eric Clapton. Chuck Klosterman once wrote that, “With the exception of Jim Morrison, Eric Clapton is (arguably) the most overrated rock musician of all time...” This may have been true 20 years ago, but not any more. Rock stars over a certain age become exempt from such scrutiny. Clapton is 67 years old. Rock royalty who have attained the status of “untouchable” tend to use this freedom to embark on one of two paths. Those like Paul Simon and Bob Dylan shun overexposure and painfully push their art forward in unexpected directions. Nostalgia is the enemy. Others like Rod Stewart and Paul McCartney “reinvent” themselves toward nostalgic ends (sometimes) to the peril of artistic integrity. Both sides are tempted to reach beyond their limits as individual artists or collaborators. But the success of any influential artist (or band) over the age of 60 is often graded on a curve, usually in accord with the monetary success of comeback tours and cameos. It’s easy to complain about this reality, but there is something refreshing about aging artists who seek to use their statesman status to encourage collaboration and reflect on the traditions that birthed their own art. Over the last decade, Eric Clapton has been more concerned with this role than struggling to maintain his status as a reigning guitar god. He has worked with diverse partners like B.B. King, Wynton Marsalis, and J.J Cale, and has paid tribute to deeper influences like Robert Johnson. His Crossroads Guitar Festival is another example of how he has used his influence to encourage musical relationships and celebrate his roots. Bob Dylan and Paul Simon may have more to say, but Old Sock gives you the feeling that Eric Clapton has more fun, and more friends. 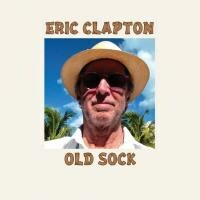 Clapton’s spirit of collaboration and love of nostalgia is fully realized on Old Sock. If you have been waiting for another blues explosion from Clapton a la From the Cradle, this is not that. Classic Clapton guitar solos and tones are not lacking, but most of these tunes are groove based outings that attempt to play to the strengths of Clapton's guests. Old Sock is a collection of diverse cover tunes from Otis Redding, Taj Mahal, Peter Tosh, Gary Moore, J.J. Cale, and George Gershwin. A myriad of guest musicians, including Steve Winwood and Paul McCartney, join him and often outshine the guitar god himself. Half of the songs on Old Sock represent pleasing arrangements of a seemingly arbitrary collection of songs. The other half are tired and unfulfilling. Clapton could have done his listeners a service if he would have resolved to forgo the reggae inspired “Further on Down the Road” and “Your One and Only Man” or the crooner influenced “The Folks Who Live on the Hill” and “Our Love Is Here to Stay”. These are just enough out of his comfort zone to come across as lackluster. It's not that these tracks are total failures; the players are top notch and the vocals are strong, but they are just nice enough to come across as uninspired. He is more successful when traversing in country and blues territory. “Gotta Get Over” is a successful original tune that recalls the kind of driving blues shuffles that could easily been written during the Derek and the Dominos era. Other highlights include his playful take (with Paul McCartney) on “All of Me” and his country lilt vocals on the Leadbelly standard “Goodnight Irene”. The other original tune “Every Little Thing” is a mash-up of previously heard Clapton styles that ends with a shoddy sing-a-long. An erratic evolution of styles is represented on Old Sock but the sunny mood is consistent and reassuring. It is sometimes boring, but the listen is never convinced that Mr. Clapton and his friends are without talent. The joy of the collaborative interplay on tracks like “All of Me” and “Angel” are what make Old Sock a satisfying but languid party. Still, Eric Clapton is far from retired. One gets the sense that he intends to enjoy his drug-free golden years. If hanging out on the front porch with good friends, and talking about the songs that compelled you to fall in love with music is your idea of fulfilling retirement, then Old Sock won’t disappoint. This is nostalgia of the honorable variety. If nothing else, Old Sock proves that Eric Clapton is comfortable being Eric Clapton. Well worn shoes are the most comfortable for doing lawn work on a Saturday afternoon. They might even make mowing the lawn enjoyable.